On July 27, 2014, Syed Rizwan Farook returned to the U.S. after a brief trip to Saudi Arabia. Traveling with him was Tashfeen Malik, his future wife and the woman who would later join him in killing 14 people at a holiday party in San Bernardino, California. 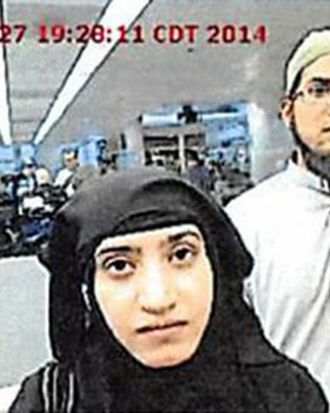 A camera at Chicago O’Hare International Airport captured the couple as they walked through customs; ABC News published the photo on Monday, and it seems to be the most recent photo of the suspects that has been released so far. Other new details about the suspects and the investigation into the shooting were released over the weekend. On Saturday, the FBI raided the home of Enrique Marquez, one of Farook’s friends and neighbors. Marquez is suspected of buying two of the “assault-style” rifles used in the attack; he checked himself into a mental hospital after the attack, and the FBI interviewed him today. Neighbors told ABC News they thought Marquez and Farook had grown apart recently as the future shooting suspect became more and more conservative. However, he added, the authorities aren’t sure how that radicalization happened yet. "The question for us is how, and by whom, and where were they radicalized? Maybe there’s not a by whom," he said. "Oftentimes it’s on the Internet, and we don’t know." On Saturday, an ISIS-run radio station in Iraq called the suspects "martyrs," according to The Wall Street Journal. Attorney General Loretta Lynch said on Meet the Press that investigators have conducted more than 300 interviews, but that no one should expect all of the answers to what happened immediately. She called the investigation "wide-ranging" and "very complex," adding that it’s a "marathon and not a sprint." According to Bowdich, there have been more than 400 interviews. Investigators also said they found 19 — not 12 — pipes that could have been turned into pipe bombs at the suspects’ house. Many of the recent questions have focused on Malik, who was raised in Saudi Arabia but returned to her native Pakistan to go to pharmacy school. “The wild card here is the wife Malik,” Representative Mike McCaul, chairman of the House Homeland Security Committee, said on Fox News Sunday. According to the New York Times, the area around where Malik went to school was notorious for radicalization; the school installed surveillance cameras in dorms, just in case radical groups decided to meet there. However, none of Malik’s professors noted anything odd about her behavior — she was remembered as a diligent, if very conservative, student. While at school in Pakistan, Malik also went to a network of schools called Al Huda, which the Los Angeles Times described as “part of a vast patchwork of Islamic seminaries, Koran prayer groups and other religious institutions that operate outside Pakistani government control and are often accused of fueling radicalism.” The schools are known for spreading anti-Western views and religious conservatism. There are also questions about how the couple managed to buy all of those weapons and ammunition, McCaul added. “We are looking at the terrorist financing aspect to this case. I believe on his salary, he was not able to buy this on his own.” According to Reuters, officials believe, given the number of weapons stockpiled at the couple’s house, that the suspects were planning multiple attacks. County employees in San Bernardino will head back to work today. Those who worked with Farook at the Public Health Department — the office that had its holiday party end in such a terrifying manner last week — will wait another week before trying to return to a normal schedule again. When they do, employees will notice a far bigger security presence around office buildings all throughout the country. On Monday, the Associated Press reported that Public Health employees attended "active shooter" training last year in the same room where the shooting took place. The report said it wasn’t clear if Farook also attended that seminar. Meanwhile, the Inland Regional Center is still closed. Besides housing the conference space where that horrific holiday party was hosted, the IRC also helps people with developmental disabilities in the San Bernardino area. The many people who went there for help, as well as the people who were working there when the shooting took place, are feeling a bit adrift in the meantime. The center will open on Wednesday at the earliest, according to NPR.